Time for another installment of Sunday Stout Soliloquies and for the first time my ritual of drinking strong dark beer every Sunday seems to be unnerving old man winter just a little. Cracks of spring are starting to show through, but I have a feeling that winter still has a few tricks up his sleeve. Hardly the time to put aside imperial stouts for wheat beers. Today we are going to look under the hood of a local beer that has gained something of a cult following, Actual Brewing’s Fat Julian. Fat Julian is one of, if not the oldest beer in the Actual Brewing line up. I’ve had it on tap many times at the Actual taproom and I rarely pass it up when I see it on tap elsewhere around town. More often than not it is served on nitro, and in that mode of delivery I find it to be so creamy, chocolaty, and delicious that it could pass for a dessert. However, this may be the first time I’ve had Fat Julian from the bottle, so I’m curious to see how it stands up without the aid of nitrogen. Not surprisingly the color is very dark brown, but when held up to the light the slightest hint of ruby highlights can be seen in the narrow base of my Spiegelau stout glass. On pouring the beer is fairly carbonated leading to a nice 2-3 fingers of biege head that settles out in due time. As I lower my nose into the glass for a sniff I’m greeted by notes of chocolate, molasses, caramel, a touch of anise, and a little ethanol just to remind you this is an imperial stout you are drinking. The taste is less complex than the nose, characterized primarily by bittersweet dark chocolate. Damn if it isn’t smooth and easy drinking though, impressive for a 9.0% abv beer. All of the ingredients conspire at the end to give you a fleeting taste of the more complex mixture of flavors found in the nose. The mouthfeel is a little light in the loafers for an imperial stout, but not off putting. 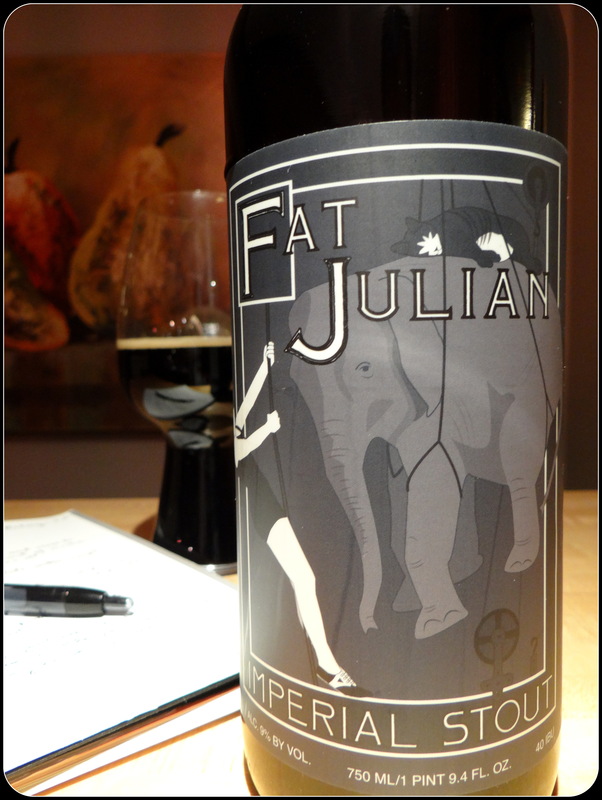 Fat Julian is not the most complex or intense imperial stout out there by any means, but you’d be hard pressed to find one that was more drinkable (maybe Old Rasputin, which is also delicious when served on nitro). I didn’t pick up any notes that scream elephant, which is probably for the better, but otherwise the description of bittersweet dark chocolate given on the label is spot on. If you’ve given up chocolate for lent I’ve found a loophole for you. Easter is still a month away so you better stock up now. I used about half of the bottle to make two Steak and Ale Fat Julian pies for Sunday dinner. They were good enough to get the thumbs up from my uber picky 14 year old daughter. So if you are into cooking with beer check back tomorrow for the recipe.